As usual in our Thedosian timelines and histories, The Blessed Age sees an awful lot of the Great Game, as mortals jockey for riches, thrones, and assorted vengeances. Here's my next installment on my all-encompassing "Tale of Years" or ultimate Dragon Age timeline project, a fairly quick but succinct look at the Blessed Age. Things start to get really fun here, since we witness some big milestones when it comes to battles and births of some familiar faces (speaking of which, among the many surprises I encountered in my research, one of these was Sten's age—I'd always pictured him as relatively young because of his occasional naivete in Origins). As always, please let me know if I get anything wrong here... I'll look forward to your thoughts! 8:05 Blessed - Kirkwall rebels against Orlais and gains the status of free city. 8:10 Blessed - Qunari in Par Vollen welcome Rivaini diplomats in a successful presentation of the Qunari way of life as something ordered and civilized. 8:24 Blessed - The Orlesian Empire launches its Second Invasion of Ferelden. 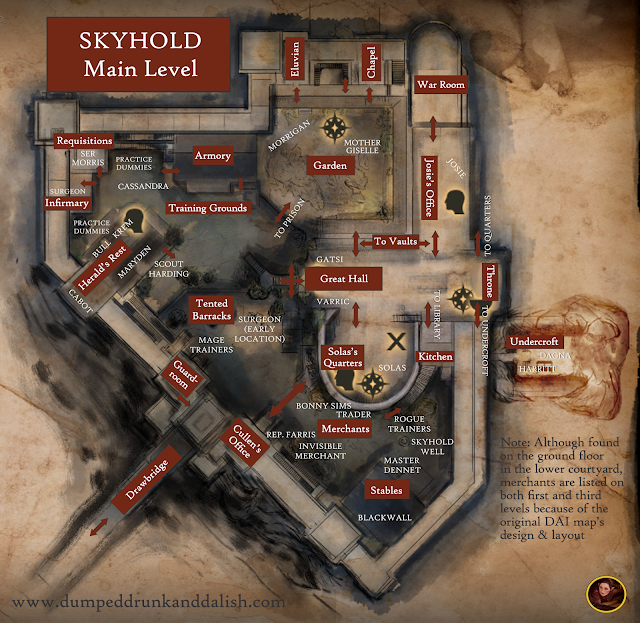 Redcliffe, Vigil's Keep and the City of Amaranthine are taken by Orlais. ▪ King Vanedrin Theirin is killed at the Battle of Lothering and Calenhad the Great's sword Nemetos is lost. Ardal Cousland, Teyrn of Highever, is killed. 8:25 Blessed - Vanedrin's son, young King Brandel, attempts to unite the country of Ferelden but fails to keep the peace. 8:31 Blessed - The House of Repose accepts a contract from the du Paraquette family to keep the Montilyet family's mercantile activities restrained to outside of Orlais. 8:44 Blessed - Orlais sacks Denerim, driving King Brandel into hiding. 8:47 Blessed - Emperor Reville orders the murder of Grand Duke Gratien, his wife, three grown children, and all eight grandchildren. 8:50 Blessed - Emperor Reville fears retribution for the assassinations of Gratien and his family, and confines himself to his room in paranoia and guilt for the rest of his days. 8:51 Blessed - Death of Emperor Reville. 8:55 Blessed - Qunari forces land in Seheron and begin the first of the next wave of assaults against Tevinter. 8:58 Blessed - The Qunari successfully reconquer Seheron. 8:60 Blessed - Aurelian Pentaghast attempts the Nevarran throne, is unmasked as an impostor, and in disgrace, joins the dwarven Legion of the Dead, the only human to ever do so. 8:62 Blessed - The burning of Treviso in Antiva. 8:65 Blessed - Shunned for centuries after Andraste, blood magic use is once more on the rise in Tevinter. 8:70 Blessed - Orlais and Nevarra battle for control of the Perendale western hills. Nevarra is eventually victorious. ▪ ~(Estimated) Birth of Duke Bastien de Ghislain. 8:74 Blessed - Birth of Grand Duke Gaspard de Chalons. 8:75 Blessed - Birth of Loghain Mac Tir. 8:76 Blessed - Apostate Adain of Starkhaven escapes the Circle of Magi. 8:77 Blessed - The epidemic of The Hundred Days' Cough in Orlais, killing the twin sons of the Emperor Judicael II and the baby daughter of his brother Florian. 8:78 Blessed Age - Birth of Maric Theirin. 8:82 Blessed - Nevarra attempts conquest of the Free Marches, but are foiled by Cade Arvale, later named Champion of Tantervale. 8:84 Blessed - Emperor Judicael II dies. 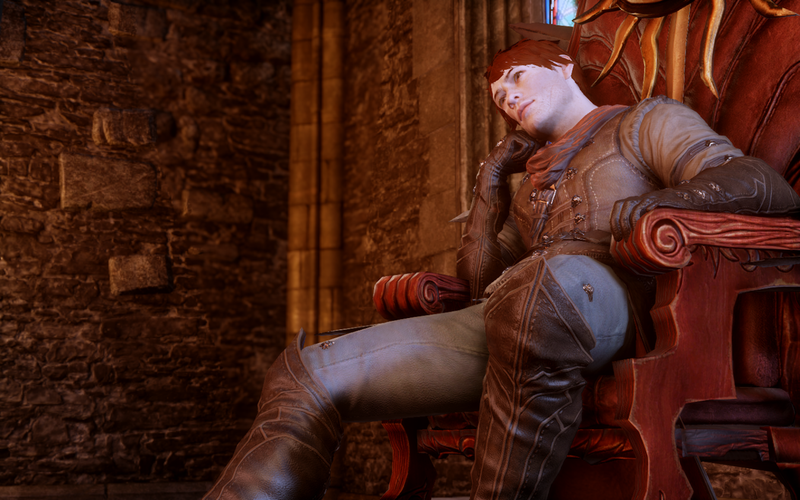 Florian Valmont ascends the throne of Orlais. ▪ Birth of Eamon Guerrin, future Arl of Redcliffe. 8:89 Blessed Age - Birth of Oghren Kondrat. Birth of Sten. 8:95 Blessed Age - The Witch of the Wilds prophesies the return of the dragons. 8:96 Blessed - Moira the Rebel Queen is assassinated by Bann Ceorlic upon orders from King Meghren of Orlais. ▪ Moira's son Maric escapes after his mother is murdered. ▪ Endrin Aeducan ascends the throne of Orzammar. ▪ Death of Duchess Marissa de Ghislain, sister to Duke Bastien de Ghislain, of the blue death. 8:97 Blessed Age - Birth of Vivienne. 8:98 Blessed Age - ~(Estimated) Birth of Thom Rainier (Blackwall). ▪ House Tethras is exiled for its denial of the Voice of the Ancestors, and for willfully manipulating the sacred Provings. ▪ Maric leads Ferelden to take the town of Gwaren. 8:99 Blessed Age - ~(Estimated) Birth of Velanna. ▪ ~(Estimated) Birth of Anders. ▪ ~(Estimated) Birth of Anthony Pentaghast. ▪ Fereldan rebels are defeated at the battle of West Hill and Maric is presumed dead. ▪ Maric, very much alive, kills Bann Ceorlic and three other nobles responsible for his mother's death. ▪ The first returning dragons emerge in Antiva, then wreak havoc across Orlais, Nevarra, then the Frostback Mountains. ▪ The Seekers of Truth abandon Therinfal Redoubt in Ferelden. ▪ Loghain Mac Tir leads Fereldan forces to victory at the Battle of the River Dane. After another dragon is sighted on the Orlais side of the Frostbacks, Divine Faustine II declares the coming age the Dragon Age.